You can use the Load Balancer Add-On with the High Availability Add-On to deploy a high-availability e-commerce site that provides load balancing, data integrity, and application availability. The configuration in Figure A.1, “Load Balancer Add-On with a High Availability Add-On” represents an e-commerce site used for online merchandise ordering through a URL. Client requests to the URL pass through the firewall to the active LVS load-balancing router, which then forwards the requests to one of the Web servers. The High Availability Add-On nodes serve dynamic data to the Web servers, which forward the data to the requesting client. Serving dynamic Web content with Load Balancer Add-On requires a three-tier configuration (as shown in Figure A.1, “Load Balancer Add-On with a High Availability Add-On”). This combination of Load Balancer Add-On and High Availability Add-On allows for the configuration of a high-integrity, no-single-point-of-failure e-commerce site. The High Availability Add-On can run a high-availability instance of a database or a set of databases that are network-accessible to the Web servers. A three-tier configuration is required to provide dynamic content. While a two-tier Load Balancer Add-On configuration is suitable if the Web servers serve only static Web content (consisting of small amounts of infrequently changing data), a two-tier configuration is not suitable if the Web servers serve dynamic content. Dynamic content could include product inventory, purchase orders, or customer databases, which must be consistent on all the Web servers to ensure that customers have access to up-to-date and accurate information. First tier — LVS router performing load-balancing to distribute Web requests. Second tier — A set of Web servers to serve the requests. Third tier — A High Availability Add-On to serve data to the Web servers. In a Load Balancer Add-On configuration like the one in Figure A.1, “Load Balancer Add-On with a High Availability Add-On”, client systems issue requests on the World Wide Web. For security reasons, these requests enter a Web site through a firewall, which can be a Linux system serving in that capacity or a dedicated firewall device. For redundancy, you can configure firewall devices in a failover configuration. 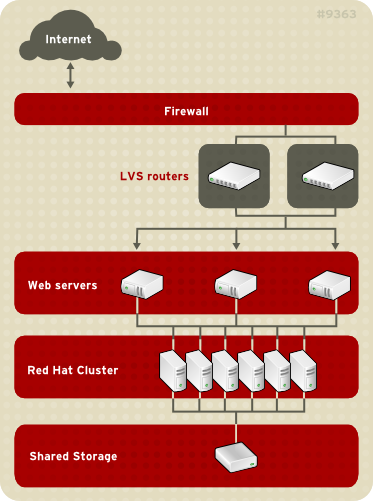 Behind the firewall is an LVS router that provides load balancing, which can be configured in an active-standby mode. The active load-balancing router forwards the requests to the set of Web servers. Each Web server can independently process an HTTP request from a client and send the response back to the client. The Load Balancer Add-On enables you to expand a Web site's capacity by adding Web servers behind the LVS router; the LVS router performs load balancing across a wider set of Web servers. In addition, if a Web server fails, it can be removed; Load Balancer Add-On continues to perform load balancing across a smaller set of Web servers.